Bloomin' Art 2013 was a memorable three-day event, a successful fundraiser, a lot of FUN! There are so many people who worked hard to make this event a success. We thank our Vineyard artist friends, our member floral arrangers, the volunteers who cooked and served, Judy B and Nancy C who orchestrated everything, and the many Vineyard businesses that donated goods for the Gala. Please click HERE to see the list of artists and businesses that made Bloomin' Art possible, and to see more photographs! Wiet B. would like to thank the membership for all the help at the Gala. She writes: "Bravo to all the flower arrangers. artists and last but not least all of you who contributed towards the success of the Opening Gala Reception on June 28. It was a beautiful, artistic evening and your gourmet creations were definitely the icing on the cake! To the serving. cleaning, pick up and kitchen crews, you are the BEST!" MaryAnn D would like to thank all of the many Vineyard businesses that donated goods for the Gala reception. Here you will find a slide show of selected photos. Please check back on July 15th for many more photos. 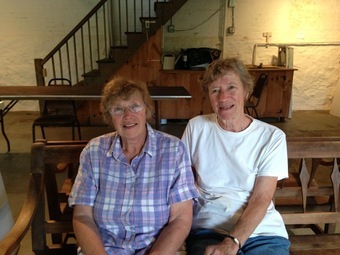 After days of setting up at the Old Mill, Judy & Nancy are finally sitting down!